Series devoted to saving treasured heirlooms from the scrapheap. Against the stunning backdrop of Burghley House, Eric Knowles and his team save yet more timeworn treasures. Hello, I'm Eric Knowles. Antiques and heirlooms, we've all got them. But are they tired, broken, faded and destined for the bin? On this programme, we could bring them back to life and maybe make you a bit of money. built almost 500 years ago by Elizabeth I's closest adviser, William Cecil. have filled this place with amazing treasure. 'It's family heirlooms like these that our Restoration Roadshow goers are queueing up to find out about. It's in a sad state, but it could come up quite nicely. It's a total disaster zone up here. The eldest son of the eldest son who this gets passed to is also allowed a free place at Cambridge University. If the glass shelf hadn't collapsed, this would have collapsed anyway. 'I'm delighted to be here in Lincolnshire for our Restoration Roadshow. You can see it's actually eaten away. It's some form of acid or lacquer. You're going to tell me that this was your rattle? If it was, you weren't a careful child. No, I wasn't. It was my rattle and it was my mother's before me. I was allowed to play with it as a child, then swiftly taken away once I'd broken it. -I think I was responsible for the break, yes. -Looking at it, you can see that it's got an entire bell missing. It's a total disaster zone up here, isn't it? I think we've got something of a chasm there which is going to need some attention. -I mean, in this condition, you're literally talking maybe £40, £50 at the tops. You're questioning whether it's going to be worth restoring? I think it'll be worth restoring just because of the family sentimentality issue. so this is why I love this so much, it reminds me of my mother and everything that it meant to her. 'What a shame this precious hand-me-down is in such a state! 'But I know just the man to help and he's based right here at Burghley. 'One of the many things that makes Burghley House so special is its emphasis on conservation. 'home to a team of expert restorers who can be called on at a moment's notice to support the house. It's Birmingham, date letter K.
but I assume it's round about 1909. -My grandmother was born in 1909. I'm not sure who the maker is, but it's C and... It looks like a C and an N.
-had it been in absolutely tip-top condition. Unfortunately, this has been totally ripped off. -we're going to be looking at about £300. -But there's a second choice, I think. As it's just going to be put in a cupboard, so it looks right, I would suggest we leave the bells. and put some holes round the outside, so it keeps there, and then apply this on. The cost for that will be £40. OK. That sounds good. That sounds better. 'Great stuff, Barry. Luckily, he has all the tools he needs in his workshop at Burghley. 'and it will be intriguing to see if Barry can pull this one out of the fire. It's a very interesting crest. I'm intrigued to know that bit more about it, so tell me what you know. We think it's a family crest. and supposedly, we are descended from him down the ages. is also allowed a free place at Cambridge University. So when I was 10 or 11 years old, my mother phoned them and wrote to them and asked them this question. And they replied saying, "Never heard of it, sorry." I don't know if the link is there or not. You're a very lucky young fellow to have something like this which has been passed down and passed down. This is a real family heirloom in every sense of the word. Where are you keeping it at the moment? I don't want to hang it up in the house because we've got a brand-new house and this looks really grotty. -Hang on. You think this looks grotty? -It looks grotty, even though it is family history and heritage. -My girlfriend wouldn't have it put up in the house. If it looked a bit nicer and brighter, she might be more forthcoming with it. When it comes to value, has anybody considered what it might be worth? The money's not an issue because I'm not going to sell it. It wouldn't be worth anything to anyone, other than me and my family. I just want it cleaned up, so it looks good and it's an heirloom I can be proud of. 'Our painting expert Lucia Scalisi has conserved everything from priceless Holbeins to Picassos. So, Lucia, a bit of a challenge? These things... I think it's a hatchment. and hung in the church and reflect the attachment of the person to the church. On the front, you see the level of discoloration. Every time they were brought out for whatever function they were brought out for, they would be oiled out. This builds up over the years and it becomes more and more discoloured. To improve the appearance, you can do a surface clean and a re-varnish. You can see it re-saturates the colours. There is some gold on this. You can see the gold in those areas. Is it going to take a lot of time and a considerable amount of money? It comes into the equation. -About 250, something like that. -Family pride to the fore. 'and Lucia's charging 250 to clean it up. 'and I think this family crest could be worth over £800 once restored. 'but only if Lucia can restore it without causing further damage to that fragile paintwork. 'all in need of urgent treatment. -It's no exaggeration to say that this is the stuff of nightmares, isn't it? Are you on therapy for this or medication? I mean, to see a pot detached from its base, that's sorry, isn't it? Yes, it is. I could be on medication if you tell me any worse. You hold on to that while I look at the base. -With pots, you always look at the base, don't you? And this gives away its pedigree. and this is going to be some time, I think, in the 1880s. -What is important is this monogram, isn't it? "ES." 'her exquisite work is some of the most collectable of Doulton pottery. What's it worth as it is...? Oh, dear me. To be honest with you, as it is, it's £100 sort of a thing. Isn't it, really? Do you mind me asking what you paid for the thing? I paid 160 for it which, to me, was a steal at the time. The good news, I think, is it's quite a tidy break. There's only a few little bits that are missing on the surface. I'm just wondering what on earth our ceramic restorer is going to say about this? 'Luckily, Roger Hawkins is one of the country's leading experts in ceramic restoration. because where it's broken away from there, that's a firing fault. That happened in the factory. or it might have been the way it was potted. Whatever reason, there's a manufacturing fault there, so that was a weak spot. -Any slight bump and that would have given away. I would see about £100-worth of my time and labour in doing that. Yeah, OK, we'll go for it. 'So, Richard has agreed to the repairs, but he's already forked out £160 for the vase. 'Add on Roger's 100 and it's getting a bit pricey. 'of my £300 to £400 estimate at auction. -they're going to charge me £500 for it. 'Here at Burghley, Barry's working tirelessly on the damaged silver rattle. 'created using the same sterling silver that the body's made out of. and this is how it would have been made originally. so both the new cap and the original body are the same temperature. being careful not to overheat it, otherwise the little rings will drop off as well. then I will apply the ring to that. 'Hold your breath. It will take a steady hand to position that handle dead centre. 'I just hope our tiny silver rattle can withstand being heated to 630 degrees. 'Here's another piece right up my street - a miraculous find brought in by Margaret Barber. I'm intrigued to know where you got it. I bought it from a bric-a-brac stall. I didn't realise it was Lalique until quite a few years later. I don't know why I hadn't looked on the bottom, but it was a bit of a shock when I found it was Lalique. -I bet it was. How much did you pay for it? Under £5 probably. £5, something like that. or if you're feeling flush, if you pardon the pun, it could be for cologne. -So this is the damage? -Yes, it's chipped, isn't it? It's broken. It was like that when I bought it. On Restoration Roadshow, we are here to say when to restore and when not to restore. In a situation like that, I wouldn't lose any sleep. 'Repairing the chip would involve grinding, then polishing the glass. Is it something that you're thinking of sending to auction or...? Well, I don't particularly think it's worth very much really. -If you were to sell at auction, they'd probably estimate it at 300 to 500, something like that. -So, not bad for a fiver, is it? -No, it isn't, is it? -Let me ask you again. Are you thinking of selling this at auction? -I think we would, yes. Prompted by my husband at the back! Can you think of a very good cause to spend the money on? It would help to pay for a holiday for my grandchildren. 'So, the Lalique bottle is off to auction with no restoration. 'I reckon this superb steal could fetch £300 to £500, despite the chip on the stopper. 'Here in Lincolnshire, Lucia is surface-cleaning the 300-year-old family crest. that you start to learn what's going on in the surface. are in fact a tinted varnish. And it's a tinted varnish over silver metal leaf to make it look like gold. And it was a cheap way of gilding. but the process itself was quite a technique. You have to have quite a talented craftsman doing that. 'but with the panel nailed into its frame, it's no easy job. I have to work fairly quickly because you've got the evaporation rate of the varnish. And I need to get the whole lot covered before it starts drying. That's it for now. 'without stripping away any more of that precious gold tint? 'Remember that broken Eliza Simmons vase? 'Ceramics restorer Roger Hawkins couldn't do much with it here, so he's taken it back to his workshop. 'He needs a bit of peace and, importantly, the right tools for the job. that's not the damage, that's the firing fault. because that's where it broke. So the best thing I can do on this is leave it alone and not do any more. so that it doesn't absorb any airborne pollution and dirt over the years and gradually get worse. The break will be visible, but we should leave it as it is. 'That's a big call from Roger. 'With the firing fault plain for all to see, will the bidders still buy it at auction? 'Back at glorious Burghley, the Restoration Roadshow is drawing to a close. 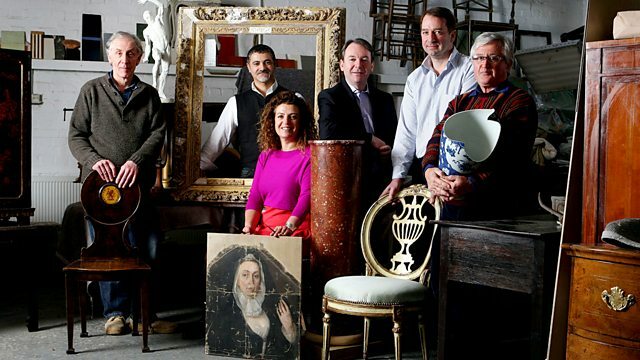 'Our experts have had a field day fixing up broken and neglected family treasures. 'Now it's crunch time as we reveal their handiwork. Liz brought in a 19th century silver rattle. 'Having belonged to her mother and grandmother, it's of great sentimental value. 'But after years of use and abuse, it was in a terrible state, including a huge hole in the top. -I hope you like this. -It'll be a great surprise to you. -You can't see the join. You cannot see... You cannot see anything. That is fantastic. I can't thank you enough. It's wonderful. I have to compliment you, Barry, because that is not so much a restoration. -That's more of a resurrection. 'Thanks to Barry, Liz and her family can enjoy this toy for generations to come. 'who have delighted us with their heirlooms and finds. -Not bad for a fiver. 'And Richard's Eliza Simmons vase that was in desperate need of expert attention. 'Fingers crossed, they'll both do well at auction. 'But first, it's time to reunite Kent with his family crest. That looks quite a bit better. -You can see the colours. -You can see the reds in it now. and you've got the three cockerels' heads that are quite clear. 'Before, this unique family heirloom was smothered in layers of grime and discoloured varnish. Thank you very much. It's great to be able to take it home in a state like this. -Good. I hope you hang it on the wall now and enjoy it as part of your family history. It's fantastic. 'The Restoration Roadshow has arrived at the Thomas Mawer Auction House in Lincoln. 'The bidders are out in force, so let's hope they're willing to part with some of their hard-earned cash. 'Remember the broken Eliza Simmons vase with the tricky firing fault? -The last time I saw this, it was in two bits. -That's brilliant. Can I pick it up? You've left the firing crack in. From the ethical point of view, you leave firing faults. It's part of its history. but to fill that firing fault would have meant doing more irreversible damage in filling it. -Yeah, that's very, very, very good. Well done. -We have a satisfied customer. in that auction audience today. If it doesn't, I'm happy to take it home. You've made a fantastic job. 'Richard's got that look in his eye. 'so he's set a high reserve of £375. 'if Richard is going to be happy parting with it. 'Let's hope our bidders are just as smitten. 'so be sure to check with the auction house. -Do you feel a slight flutter there? -Well, looking forward to it, yeah. -I am too because it's a lovely vase. And who's going to start me on this one at...£300? £200 to get it going then? £200? -Oh, they're playing hard to get. -He's not going to buy it for £100. -Yeah, almost but not quite. that...that Roger Hawkins is one cracking restorer. I shouldn't use the word "cracking" where pots are concerned! but as far as I'm concerned, I'm not losing out really. -Are you feeling a sense of excitement? -Yes, I am. I'm a bit nervous as well. but they're all wondering whether they'll buy their lot or their item will sell. 'Margaret is hoping to raise some money for a holiday with her grandchildren. I know we estimated this at £300 to £500 and you have put a protective reserve on it? -Yes, we have - £300. Well, it's well worth that and more. Well, that means you're alive, doesn't it? Next lot, the Lalique scent bottle. And who'll start me on this one at £200? At £200 for the scent bottle? 360, lady's bid at 360. Are you out? I never had any idea it was worth as much as that. 'That's over £350 profit, less auction fees. Not bad, considering Margaret only forked out a fiver. Join us again and marvel at the skill of those expert restorers on Restoration Roadshow. In today's show from Burghley House, Eric Knowles and the team pull out all the stops to save tired and careworn family antiques from the bin. While Burghley's resident gold and silversmith Barry Witmond tries to shake new life into a wonderful Victorian baby rattle, Lucia Scalisi aims to shed much needed light on a painted family crest buried under layers of grime. Ceramics expert Roger Hawkins has a lot on his plate too. Can he resurrect a badly cracked 19th-century Royal Doulton vase designed by Eliza Simmance and help it shine at auction? And will a Lalique vase picked up at car boot sale for just a fiver prove a surprisingly valuable purchase for its unsuspecting owner?